I’ve never seen the like of those colourful carpets, wow! Wow is the right word. Historical accounts report that fields of wildflowers stretched for miles before the era of farming and ranching and modern settlement. 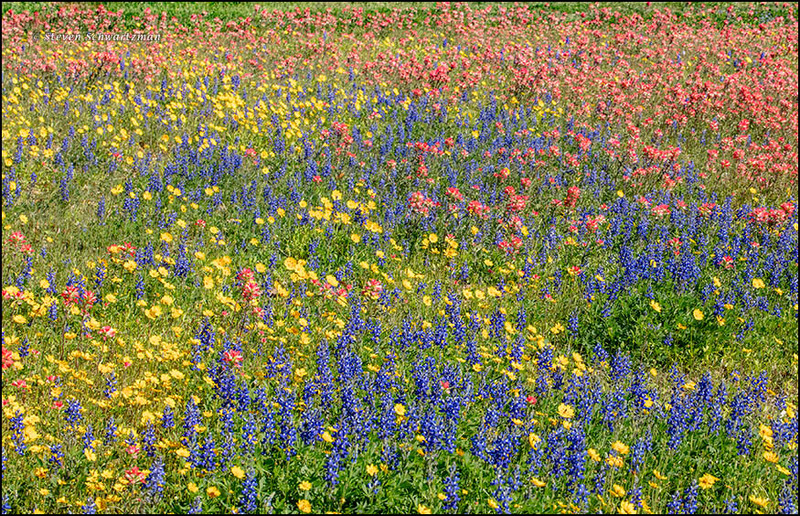 Even now Texas remains famous for its wildflowers. The old euphemism for being a cemetery resident — “pushing up daisies” — came to mind. Daisies are well and good, but pushing up a wealth of wildflowers like these would be even better. I’d best get myself down to Galveston this weekend and check out what’s happening at the Broadway cemeteries. It’s interesting to see the same carpeting effect with paintbrush as appears there with coreopsis and such. I will say that, as lovely as great swaths of paintbrush and bluebonnets can be, I do prefer mixed bouquets, especially in a field. There’s nothing like seeing them in real time. Eve, too, is of your mind, and often mentions how much she prefers mixed colors to a single one in an expanse of wildflowers. I’ll also jump on the bandwagon. At the same time, the most frequent and expansive wildflowers we saw near New Berlin were Indian paintbrushes, and so I photographed those monochrome colonies as well. I may post one or more of those pictures here too. There’s always plenty in Texas to be careful about when walking around outdoors: cacti, prickly and thorny vines, fire ants, sandburs…. At least the permanent residents in the cemetery won’t reach out and attack me. I live in Colorado now but I sure miss the wonderful wildflower displays of central Texas!! Such special memories! The good thing is that you can always visit, especially at this time of year when it would provide a break from the cold in Colorado. This is beautiful, and I agree, every cemetery should be covered with wildflowers like this one. And it beats the heck out of having a crew of jail inmates, wandering around with noisy weedwhackers. Many people unfortunately have the same mentality about cemeteries as they do about roadsides and “vacant” lots: mow everything to within an inch or two of the ground. 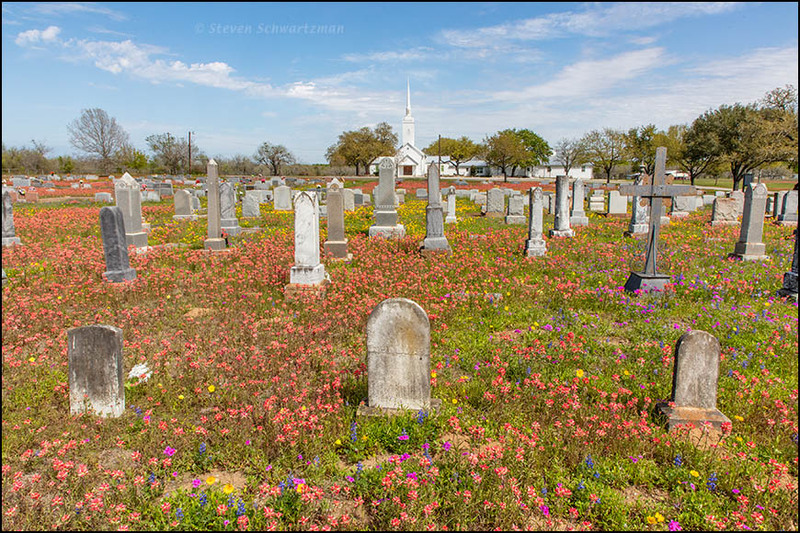 Nevertheless, from what I’ve seen online, in that part of south-central Texas there are several cemeteries covered with wildflowers. I hope to visit more of them now that the peak wildflower season is beginning. The wildflowers are one of the best parts of Texas. I was also going to mention Galveston. Thanks. I’m so glad that the people who maintain that cemetery have the good sense to leave the wildflowers alone. Beautiful shots. 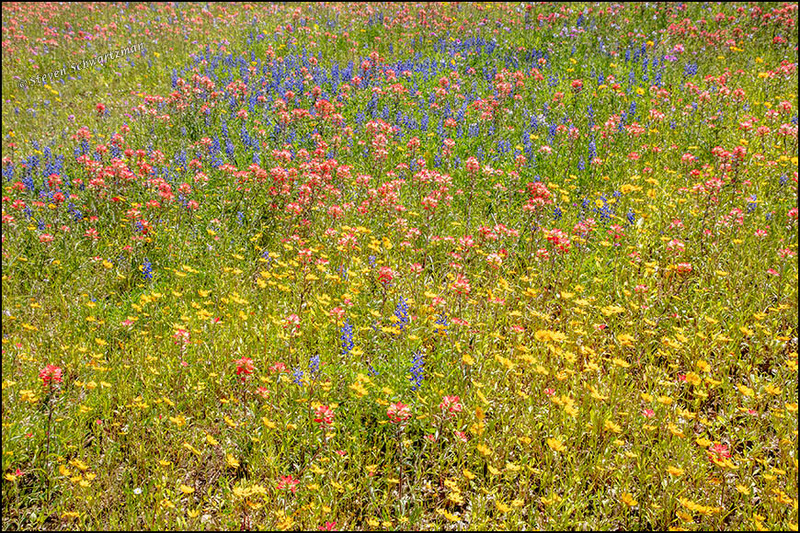 I recall hearing a story on NPR about Texas wildflowers. The reporter relayed a story, or perhaps, he was the one who witnessed–I don’t remember. The story was of driving and seeing cows in a lake; upon a second glance, the” lake” was a field of bluebonnets. Yes, Texas in a good spring. That’s a good story. Texas has almost no natural lakes of the aqueous kind but plenty of the bluebonnet kind in the spring. At this time of year we also get red-orange “lakes” of Indian paintbrushes that, like bluebonnets, tend to form large exclusive colonies. I quite agree. Nothing better than a churchyard that has been allowed to be a sanctuary for nature. This one is particularly beautiful with all the colourful flowers. Have you seen any flower-covered churchyards in Britain? Nothing like this one. But several old ones with shrubs and wild flowers. Maybe you can start a campaign to sow wildflower seeds in some of England’s churchyards. Pictures of a few good ones in Texas might make people enthusiastic. Sneaky sowing would be a change from snowing. Thanks for the link. I left a comment there but it seemed to vanish as soon as I clicked the button. That is absolutely stunning. I wish all cemeteries looked like this. In the Peoria area sometimes you come across old cemeteries that still host tall grass prairie, but it is mostly a bunch of just that~tall grass. Not lovely like this. We spent a long day out today (which is why I’m replying to your comment so late) and visited another church cemetery as flowerful as this one. Woo hoo Texas! At least there are some people left who aren’t afflicted with mower madness. Thank goodness for that. How long does this spring bounty typically last? I understand the hills in California are lit up right now with poppies. They look glorious in the photos. The bluebonnets and Indian paintbrushes may last a few more weeks. Indian blankets have come out in modest numbers so far but the big colonies of them haven’t appeared yet. There’s typically some plentiful wildflower species or other into May. I saw some views of this season’s California poppies on television. Paul will be traveling to Texas on Monday for a presentation he’ll be giving. He’s taking a whole week to drive from San Antonio to Dallas to see some friends. Wish I could go, too but impossible. Hopefully he’ll see lots of beautiful flowers on his way. I don’t see how he could not, given what’s happening. Maybe you can suggest to him that he travel from San Antonio via roads other than Interstate 35, which is a nuisance to drive; by taking back roads he’d likely see more and better wildflowers. Too bad you can’t go along. I wish I could. While he was visiting his friends, I could be visiting you. I’ll suggest that route to him. He’s a fan of back roads. Also, if he has time, he could take a jaunt just a little distance from San Antonio to see the fantastic wildflowers there now. He could visit Poteet and Pleasanton a bit to the south or New Berlin a bit to the east. Those are good suggestions too. Thanks, I’l mention them to him. If I can’t get out of leaving this mortal shell behind, I would not mind being covered by a quilt of colorful flowers similar to the one you are showing us here. My sentiments exactly. I don’t know why the prevailing style in almost all American cemeteries is so toned down. Give me real flowers, not artificial ones. I appreciate your floral comment. Ah, Steve, you’re doing my heart good over here in New Zealand. I miss bluebonnets and springtime more than anything else in Texas. I’m with you — all cemeteries should be covered with wildflowers. I understand why you miss this so much, Jenny. The wildflowers a little below San Antonio are said to be the best in a decade, and we spent all day yesterday in that area again, this time to the southwest rather than the southeast of San Antonio. At least you get to see it vicariously here. Thank goodness for you! I’m going to bed to dream of bluebonnets, Indian paintbrushes, winecups, cosmos, evening primroses, and Maximilian daisies. G’nite! Pleasant wildflower dreams to you. By another coincidence, this morning I came up with sepulchrofloral to refer to this kind of scene. We could combine it with your word to make phantasmasepulchrofloragorical. Have you seen pictures of the superbloom in California? I’ve seen pictures of the California poppies. That is most of what the superbloom is. Profusion of California poppy used to be more common before the exotics forced them all out. Now, they bloom like that in regions where the exotics do not do so well. Sorry to hear the exotics forced them out of some of their former haunts. Yes, it is like all the people who migrated into the Santa Clara Valley. Yes they should be carpets of wildflowers. We are planning on cremation, but might change our minds if we could rest in ground like this. Now you’ve made me wonder if anyone has ever arranged for wildflowers (as opposed to cultivated flowers) to be maintained on their grave. Then you’ll have to arrange for a trip to Texas during our spring and your winter. As many good things as NZ has, it can’t match the wildflowers. Air NZ offers a non-stop flight from Auckland to Houston (that’s the flight we took each way). Oh that sounds like a grand idea! Sure thing: come on over!